Huntington’s disease (HD) is a rare type of hyperkinetic and neurodegenerative disorder characterized by abnormalities in cognitive, behavioral, and motor system, associated with picky degeneration of GABAergic medium spiny neurons (MSNs) in basal ganglia. HD results from an unhinged expansion of CAG (glutamine) repeats in the coding region of the Huntington gene. 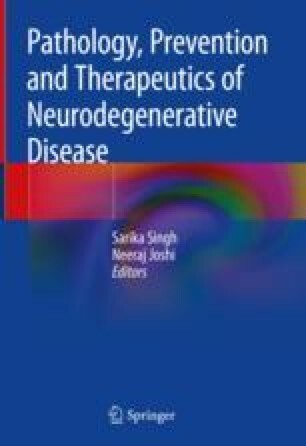 Emerging strides have enabled us to understand the role of various pathogenic mechanisms like oxidative stress, neuroinflammation, excitotoxicity, mitochondrial dysfunction, apoptosis, transcriptional dysregulation and ubiquitin-proteasome pathway dysregulation by mutant huntingtin protein (mHTT) in HD. Presently, treatment of HD is symptomatic in nature, without targeting any specific neurodegenerative processes. In particular, genetic and toxin based HD experimental animal/models have been helpful in studying the sequence of neurodegeneration in HD. Abovementioned molecular mechanism implicated in the pathophysiology of HD presents valuable future therapeutic targets. The apparent or traditional approach of treating HD subjects with antioxidants and anti-inflammatory agents is beneficial in well-established various toxin and genetic models with considerable positive results to some extent. However, these findings could not be effectively translated to clinical practice as use of antioxidants and anti-inflammatory agents met with limited success, highlighting several limitations to these approaches. Therefore, alternative approaches that can dodge these limitations are being tried and adopted. Present work is an attempt to highlight various advancements that are being investigated at different phases of drug development for management of HD and related pathogenesis. Authors have made significant efforts to discuss various molecular and cellular pathways as a potential drug target for the management of HD and related problems.